Last November, after a brief tryst with Riot Game's League of Legends, I wrote an article about player behavior as it relates to the game's design. When teams lose, players often engage in an illogical blame game. Afterward, I put away LoL permanently - or so I thought. Recently, I have been getting back into the game, doubling the number of matches I had played in just a couple months. Of all the games at my fingertips, and some new single-player experiences waiting to be played, what brought me back? What gives this game a siren call? All the games I consistently return to are team-based. The best of these provide enough emergent moments to create memorable scenarios I can share with friends - something akin to a tabletop RPG scenario. While I do occasionally play Modern Warfare 2 again, it does not emphasize team cooperation enough. In fact, most games seem to be won by a couple amazingly skilled individuals acting like Rambo. Like Left 4 Dead 2, one of my gaming staples, League of Legends demands excellent cohesion and cooperation to succeed. Interestingly, how players interact with their teammates changes over time. A typical five versus five match consists of two teams of two pushing a top and bottom lane, with another covering their own. 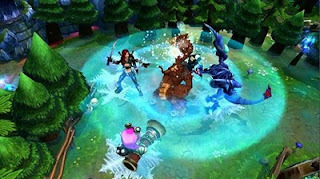 Early gameplay consists of two champions adjusting their play styles to match each other's strategies and unique abilities. Midway through the game, pairings start to shift with small skirmishes occurring sporadically around the map - this requires a great deal of on-the-fly teamwork. 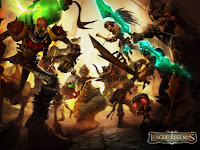 Finally, the last stage generally consists of large team battle, which require each player to understand party roles and how best to engage in combat as a team. Few games can evoke such a strong sense of team pride than a well won round of LoL. Something LoL has over many competitors? It is completely free to play. Of course the games I already own are, in a sense, free. But LoL is designed and distributed in such a way as to consistently add value free of charge. Since the game's release last October, Riot Games has released eleven new champions - almost two per month. Malzahar was released a little over a week ago and already Olaf, The Berserker has been announced. Each new playable characters creates the prospect of game changing combinations between champions, creating a consistently dynamic battlefield. Although new players cannot access the entire game immediately, Riot implements a rotating champion roster of free-to-play characters. Each week, a medley of ten champions are available to everyone. Overtime, players can experiment with all the characters LoL has to offer. Meanwhile, players earn "Influence Points" to purchase the avatars they've enjoyed using the most. I find myself eager to return to LoL to see what new experiences they concoct on a weekly basis. League of Legends rewards repeat visits with a multifaceted leveling system. As discussed above, players can increase the size of their personal character roster over time - allowing them to "level up" in a way. 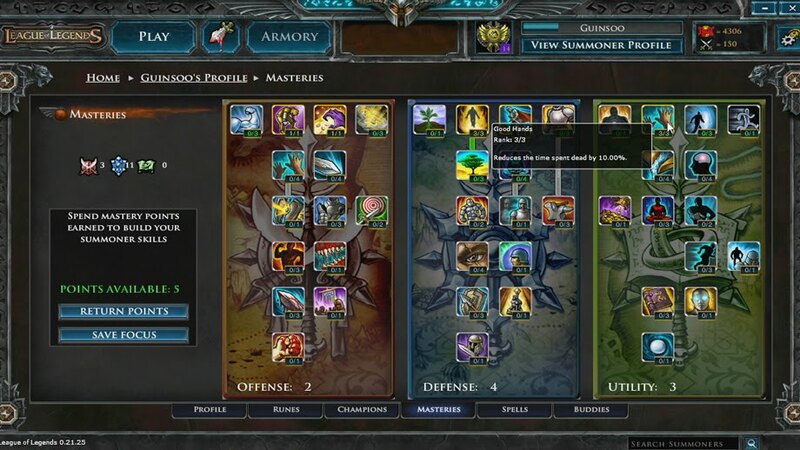 There is also a persistent "Summoner" profile for each player with a rune and mastery system. Masteries are the more traditional leveling element, similar to World of Warcraft's Talent Points. They allow players to specialize themselves by spending points in three skills trees: Offense, Defense, and Utility. 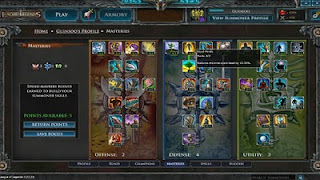 Players also have two separate pages in which they can slot runes to further specialize and enhance their play style. Runes can be purchased with Influence Points, once again rewarding continued play with gradual and measurable progression. Oddly enough, I am generally opposed to leveling systems. They tend to arbitrarily extend game length and encourage grinding as a favorable way to earn experience - essentially converting play to work. However, in LoL, the persistent profile has no limiting effect. While the rune and mastery system are certainly influential, Riot's matchmaking system is such that teams encounter their Summoner equals. Meaning all games start on a relatively level playing field, with all character abilities accessible during the match. The leveling system, while artificial, still only rewards the player, offering a new depth of specialization on top of the same basic gameplay. Player behavior has not changed all that much since my first impressions of the game. Although I try to do my part, wishing players a friendly good luck before the match. Regardless, LoL has a continual appeal. I can jump into a game quickly, play a relatively short match, and know it is designed to encourage dedicated team-play and disincentivize "rage quits." I have gotten enough enjoyable time from LoL that I even purchased myself a character skin. I know, it sounds lame, but I had no qualms about the purchase. Those sea nymphs at Riot games deserve plenty for their success. Good to see you are coming back to LoL since your last article on it. I was also considering to make a come back in this game this summer, and your post convinced me to do so! Great! I certainly think the game is worthy of attention. You can find me playing probably too regularly as Arkania. How does this game compare to WoW? I tried to enjoy WoW but it ended up being a grindfest 90% of the time. Plus, I saw the endgame and realized I didn't want to invest that kind of time in something so... well, lame.